"Bradford pears lining the median strip of the parking lot of Alexander" by L. Michael Hill Ph.D. 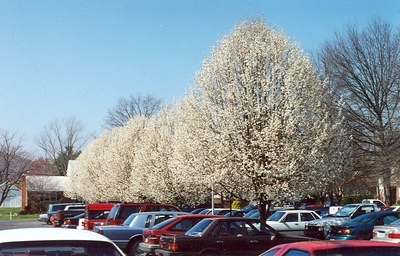 The median strip of the parking lot of Alexander Mack Memorial Library contained a row of Bradford pears, Pyrus calleryana (Rosaceae), early 1990’s. These replaced an equally interesting stand of crabapple trees.